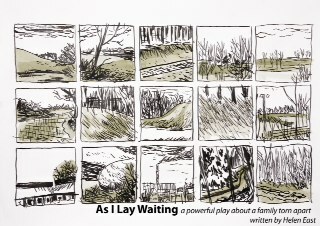 ‘As I lay Waiting‘ is a drama about redemption, family and loyalty. In a single setting of a peat bog. Rose, Tommy and their daughter Katie spend most of their days in a peat bog in Ireland. Tommy is digging holes, lots of them, searching for something, he can’t remember what, because of dementia. When, in his digging, the past returns it effects all their lives and relationships. Theatre By Numbers were thrilled to be involved with the event at Hope Mill Theatre as part of their Power House Plays week. Thanks to everyone involved and we'll hopefully be taking this one a further in the future.